Discussion in 'Flat Earth' started by Laser, Aug 30, 2018. Maybe the lack of distortion through aircraft windows can be established by photographing the stars just above the horizon and verifying that they are not distorted into a curve like flat earthers suppose the horizon to be. A low distortion wide angle lens could be used and the alignment could be checked using a picture of the same stars from a mountain top. The two pictures could be overlapped to verify star positions. It would be desirable for the stars in question to be positioned along the middle height of the picture frame where lens distortion is smallest. Can we photograph stars from an airliner or would the cabin lighting blow out the exposure? It may be necessary to bring a black cloth to cover the inside of the window around the camera and photographer. Stars may require long exposures which could be spoiled by even slight airplane movement. Seems a bit much without a specific claim. Can you give an example of what exactly they think is happening? I look out of airplane windows all the time. They do not distort noticeably. where he shows obvious curvature even in the supposedly flat cockpit windows. The interesting part showing the distortion is about 30 seconds starting at 6:00. Of course we could try to explain to flat earthers that a window may have little distortion when looking through it normally, even if it has a great deal looking through such a shallow angle, but I don't think they'd be likely to give much weight to such an explanation. Surely it would be much better to compare the aircraft wing, or engine, in photos taken both through the window and outside the window. Big straight lines (and circles) that are much easier to see than stars. Surely if there was any significant distortion we should notice changes to apparent shape of airport terminal buildings and nearby structures when taxiing ln the ground? That's when there would be plenty of vertical and horizontal straight lines that would show the alleged distortion. I doo remember seeing a tv programme debunking some UFO sigbtungs which showed how the rim of an old fashioned porthole window could produce a distorted and "cut off" view of part of thd tail. However, Ive never seen that in a more modern window. It might be, but it was many years ago, so I dont recall. They think airliner windows are curved such as to make the horizon look curved. You're going to have to come up with a specific claim of evidence here. Who thinks this? What did they say? What evidence did they give? Professional airline pilot and ace flat-earth debunker Wolfie6020 has covered this topic in several videos on YouTube, with lots of shots showing undistorted horizontals through aircraft windows (cockpit or passenger windows.) I can't instantly find the best one, but I will add a link when I can. I only mention it now in case other readers know his videos better than I do. It's a bit of a red herring. Viewing the curve from a plane window is a tricky thing to do for the average person. I've not really been able to see it myself. You need to be above 45,000 to get a distinct curve, with the visibility problems of haze and cloud. Wolfie's video at 46,000 feet after sunset is probably optimal. He pans up and down to show it's not the camera. In the description to the video he links to two other videos showing the window is not causing the curve. Where at 1:29:55 he claims: "The glass used on all commercial airplanes however is curved to remain flush with the fuselage. This creates a slight effect mixed with the confirmation bias people mistake for being the alleged curvature of the earth." The only evidence given seems to be a picture of an engine nacelle with the bottom warped into a horizon like curve, though this looks to be caused by lens distortion rather than window distortion. 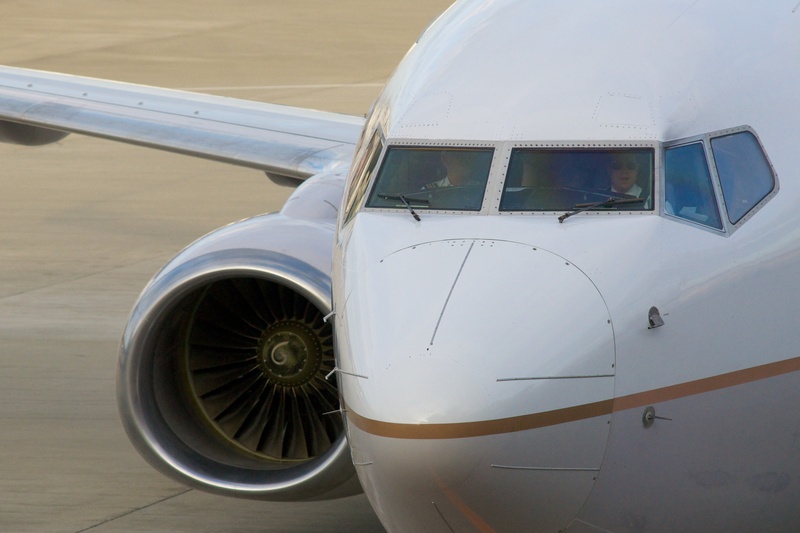 Of course passenger windows do indeed seem to be almost always curved to match the fuselage. But curvature in that direction shouldn't cause horizon curvature unless the plane was pitched up or down, and even then probably not enough to match horizon curvature. But as I mentioned above, I'm dropping this line of argument as not likely fruitful. However, given that the windows have the same thickness along their cross section, regardless of curvature, they won't distort the light rays going through them.